This DIY Chrome Manicure Is Perfect For Your Lazy Sunday Afternoon! Guilty of spending 2,000 bucks on a gorgeous chrome manicure at the nail salon? Me too (about 5 times and counting!) But you'll be surprised to know that there's an at-home kit that will give you the same results at one-third of the cost! 1. Paint your nails with regular nail polish and let them dry. Use any colour you like. 3. Apply one or two layers of top coat and that's it! You're done! 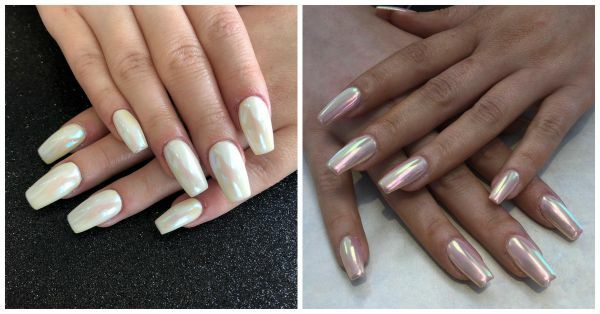 Different base nail colours will leave a different chrome colour on your nails. A black nail polish will leave you with a silver chrome effect. A pink or red nail polish will leave you with a rose gold or pink chrome effect. Experiment a little and see what you like best! Don't forget to apply a good amount of top coat to seal it all in! Since this is not a salon gel manicure, it's not going to last you as long!